Dog biscuits are a hard, dry, dog food product, typically composed of protein, carbohydrates, fat, and fiber. They are made in much the same way biscuits are made for human consumption. The raw materials are combined in a large container, the biscuits are shaped, cooked, cooled, and packaged. First developed accidentally during the 1800s, the dog biscuit snack market has grown to over $480 million in yearly sales. Dog biscuits were invented accidentally in a London butcher shop during the late 1800s. According to the story, the shop's owner was trying to expand his business by creating a new biscuit recipe for his customers. After baking a batch, he tasted them and thought they were terrible. He gave one to his dog, and the dog gobbled it right up. This gave him the idea of making biscuits especially for dogs. He made his biscuits in the shape of a bone and they began to sell rapidly. In 1908, his recipe was bought by an American businessman who introduced it to the United States. The F.H. Bennett Biscuit company was established, and they began selling the dog biscuit under the name Malatoid. In 1911, the recipe was granted a patent. The name was changed to Milkbone in 1915 to reflect the fact that cow's milk was one of the main ingredients. The Milkbone dog biscuit brand was then acquired by Nabisco Biscuit Company and it dominated the dog biscuit market until the late 1960s. In fact, during most of this time, it was the only commercially available dog biscuit. Initially, it was marketed as a treat for dogs, but eventually the health aspects such as cleaner teeth and better breath were promoted. In the early 1970s, a number of manufacturers came out with competing products. This competition has remained, resulting in hundreds of different dog biscuit products. It is estimated that over 50% of all dog owners regularly give their dogs treats. While treats are not essential to a dog's diet, they are typically given as a way to indulge or train their pets. The classic dog biscuit is a small, hard, bone-shaped product that is colored to reflect its flavor. Traditional flavors include beef, chicken, lamb, turkey, liver, cheese, and bacon. However, certain manufacturers have produced some interesting flavors such as oatmeal, raisin, spinach, peanut butter, and coconut. In addition to flavor variations, dog biscuits also are sold in different sizes; small biscuits for small dogs, large biscuits for large dogs. The shapes have also changed from the conventional bone shape. In an effort to differentiate their products, marketers have produced dog biscuits with shapes as varied as animals, people, bacon strips, and even fire hydrants. Since most treats are also sold as healthy food supplements, dog biscuits are typically fortified with vitamins and minerals essential in a dog's diet. Low fat varieties are also available for dogs that are overweight. The packaging for dog biscuits used to be strictly limited to cardboard boxes because this minimized breaking. However, advances in packaging technology have resulted in the use of foil packaging and plastic containers. The primary ingredients in a dog biscuit recipe are carbohydrates, proteins, fats and oils, and fiber. These are combined with other ingredients that have a significant effect on the dog biscuit's final characteristics. The ingredients used for dog biscuits are specially tailored for dogs, and are chosen to be nutritious, easily digested, palatable, and economically feasible. While the materials have a high nutritional content, they are typically not as high quality as similar ingredients used in human food. Flour is one of the most abundant ingredients in most dog biscuit recipes and provides the bulk of the carbohydrates. It is obtained by grinding corn, wheat, or rice into a powder. This powder contains the three main parts of the seeds including the bran, germ, and endosperm. Of these, the endosperm is responsible for most of the important baking and shaping characteristics. Chemically, flour is composed of starch and protein. When mixed with water, it creates a mass called gluten that can be cut and formed into the dog biscuit form. The proteins added to dog biscuits supply the animal with essential amino acids, improve taste, and in some cases supply energy. They are derived from a variety of sources including animal and plant. Typical plant protein ingredients found in a dog biscuit are such things as corn gluten meal and soybean meal. They are generally less expensive than animal proteins and are therefore used in greater quantities. A drawback to plant proteins is that they contain certain indigestible oligosaccharides that can cause undesirable flatulence. Animal proteins are added to improve the food characteristics of the biscuits. This includes ingredients such as poultry byproduct meal, meat and bone meal, and dried liver meal. Milk and egg are also used as a supply of protein. Fats and oils are added to biscuit recipes to provide flavor and nutritional energy. They also have a significant impact on the finished texture. They are derived from plants, fish and animal sources. Much of the fats and oils used in pet food is obtained from the fast food industry. Fiber represents another important type of nutritional ingredient found in dog biscuits. Normally, fiber is present in a variety of the other ingredients. Extra fiber, such as wheat bran or corn bran, is added to improve droppings and water absorption. This ingredient is more important in calorie-controlled recipes. Other ingredients are added to dog biscuit recipes that do not have a direct influence on the animal's nutrition. Antioxidants are added to prevent the breakdown of vitamins and other nutrients present in the biscuit, and to maintain freshness. Examples of these materials include zinc oxide and manganous oxide. Flavor enhancers have become another important additive. They are used to make a biscuit more appealing to the pet. It has been found that dogs tend to prefer meat and fish flavors. Although dogs are essentially color blind, artificial color additives are added for the benefit of the pet's owner. Finally, preservatives such as BHA are added to prevent microbial growth. The speed of dog biscuit manufacture varies depending on the method used to produce them. The slowest methods involve manual mixing and oven baking. Other manufacturers use a highly automated process that can produce tons of product per hour. Both methods involve general steps include blending and conditioning of ingredients, shaping, baking, cooling, and packaging. 1 In the automated method, an extrusion method is typically used. In the first step, the dry ingredients are mixed together. Water is then added to this blend to bring the moisture content up to about 30%. This creates a paste-like dough that is next pumped into a conditioner chamber and heated. Within this chamber, other ingredients such as animal byproducts or other moist ingredients are added. From this chamber, the batch is moved into an extrusion machine. Commercial dog biscuit manufacturing operations begin by mixing the dry ingredients together in industrial-sized mixers. Water is added to increase the moisture content to 30%. Once all the additional ingredients are added and the batch is heated, the paste-like dough is transported to an extruder. The extrusion machine is a large, enclosed screw which has a tapered end. The screw is turned, pushing the dough through the extrusion chamber. As it is moved through, it heats up due to the friction generated. At the end of the extrusion chamber are the forming dies. These can have a variety of shapes such as bones, stars, circles, etc. As the batch is pumped out, automatically cut into individual biscuits, and laid on drying sheets. The biscuits are transferred to a metal conveyor belt and moved through an oven. Prior to packaging, the cooked biscuits may be coated with flavor or vitamins. 2 The extrusion machine is a large, enclosed screw that has a tapered end. The screw is turned, pushing the batch through the extrusion chamber. As it is moved through, it heats up due to the friction generated. At the end of the extrusion chamber are the forming dies. These can have a variety of shapes such as bones, stars, circles, etc. As the batch is pumped out, automatically cut into individual biscuits, and laid on drying sheets. The sudden release of pressure causes the entrapped moisture to create an expansion of the biscuit much like exploding popcorn. From here, the biscuits are transferred to a metal conveyor belt and moved through an oven. 3 The baking of the dog biscuits is done in a tunnel oven. The oven is anywhere from 100-300 ft (30.48-91.44 m) long. As the biscuits travel through the oven, the biscuit goes through a setting phase where it takes on the shape of the final product. Next, it is dried out to about 10% moisture content. The amount of time baking time is controlled by the speed of the moving conveyor belt. 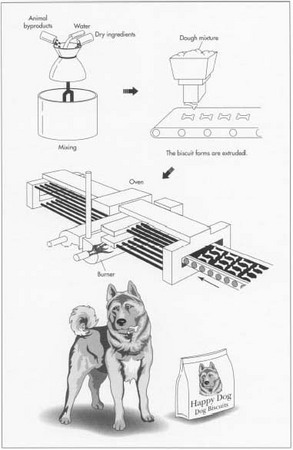 4 The dog biscuits exit the ovens and travel through a series of conveyors to cool. They may be flipped to ensure that cooling is throughout. Depending on the recipe, additional coating ingredients may be added. These can include fats, vitamins, and other flavor enhancers. They are applied using depositor machines that spray coat the biscuits. If necessary, excess topping can be removed by forced air or shaker devices. 5 The final step in the manufacturing process is packaging. Because certain dog biscuits are fragile, the packaging is typically rigid. The biscuits are moved onto weighing bins. When the weight of the biscuits is heavy enough, they are dropped into boxes that are appropriately decorated to attract customers. These boxes are put into larger case boxes, stacked on pallets, and shipped to stores. At various points during manufacture, tests are performed on the raw materials and finished product to ensure that they conform to specifications. Before any ingredient is allowed to be used, the quality control lab evaluates its characteristics and properties. This involves studying things such as appearance, color, odor, and flavor. The particle size of the solids, pH, and viscosity may also be tested. During production, each batch of dog biscuit is also carefully monitored to make sure that the product being shipped to stores is of the same quality as the one developed in the food laboratory. The usual method for ensuring quality is to compare a random sample from the batch to an established standard. Since the 1800s, manufacturers have developed significant improvements in the production of dog biscuits. These improvements are likely to continue in the future resulting in faster and more efficient production. Improvements will also be made with new packaging and innovative merchandising techniques. The market for dog biscuits is expected to grow steadily, being considerably impacted by developments in the dog food market. Experts suggest that all natural, healthy treats are expected to have the greatest growth potential. Kirk Othmer Encyclopedia of Chemical Technology. John Wiley & Sons. New York: 1992. "Bone appetit! Kansas City's Three Dog Bakery pampers the palates of man's best friends." People Weekly, April 3, 1995. Pavia, Audrey. "History of Dog Treats." Pet-ProductNews. July 1996. United States Patent 5,501,868. 1996. I am intersted to install oven for dog biscuits. I have 27 years technical experianec of biscuit manufacturing. I am working with Britannia Industries limited since 1985. Are commercial dog biscuits ok for humans to eat? This may seem like a silly question but I have a friend with a child who gets into everything. On two occasions he has eaten dog biscuits. The poison control center said there was nothing in the biscuit that would be dangerous to humans, i am asking the question to be sure. Thanks.